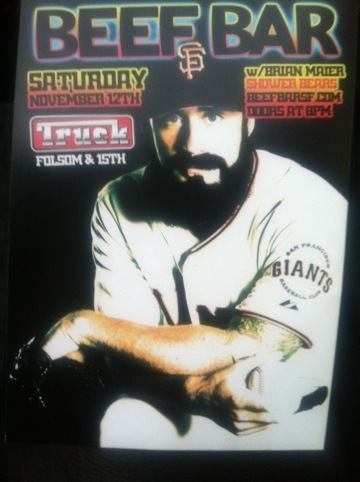 Giants Closer Brian “The Beard” Wilson is Beef Bar Cover Bear! 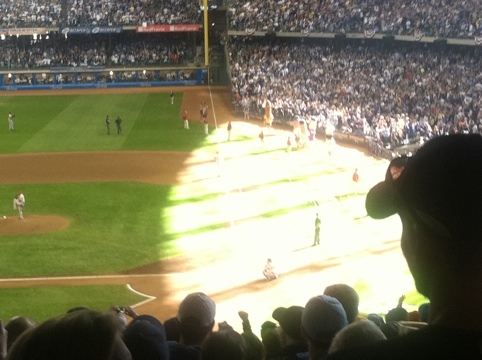 Our correspondent AidanAbroad blogged about Milwaukee’s strange tradition of Sausage Racing at Brewer’s games. Check it out here. His iPhone couldn’t get a good zoom, though. A quick trip around the internet solves that. Here are the sausages getting ready to…uhhh…race! 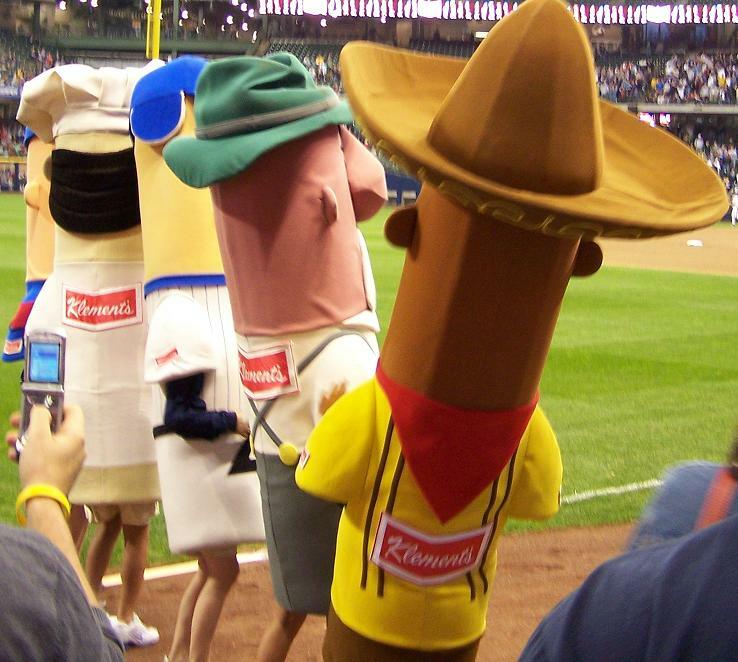 I was introduced to a fascinating Milwaukee tradition today at the Brewers game – phallic food sports, i.e., the Sausage Race. In the 6th inning, people costumed as different kinds of sausage (brat, chorizo, hot dog, etc) race around the field. Today the chorizo won, despite his huge sombrero. The zoom on my iPhone wasn’t able to capture a great shot, but on the right you can see sausages racing around the field toward the finish line. 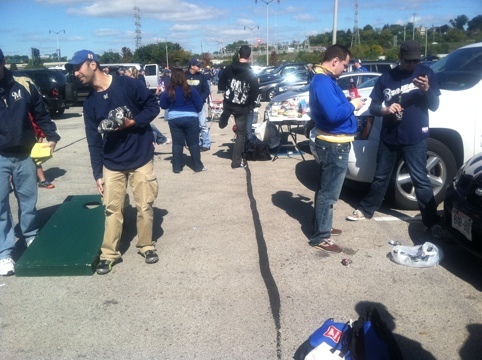 Outside the Milwaukee Brewers postseason game this morning. Timmy the Kid! Our Giants serially humiliate Oakland. When he’s not in the ballpark SF Giant’s pitcher Tim Lincecum looks more like a slacky hipster kid than a world class athlete. All that changes on the mound. Timmy the Kid moves like a lanky jungle cat, all energy in reserve until he unleashes his fastball. Poetry in motion and even the floppy hippy hair works. Five nothing in career starts against the As, who have lost eight straight to the Giants. For John Sheas’s article in the San Francisco Chronicle, click here. Big balls on this little man and a bigger beard on his buddy. 16 year old YouTube star Keenan Cahill hams it up Dynamite lip-synch style with the infamous Giants pitcher Brian Wilson and cute fielder Cody Ross. And a furry. Bizarre! Cahill lives bravely with Maroteaux–Lamy syndrome, a condition that severely stunts his growth. Wilson lives bravely with the adulation and derision of millions. For a great clip of him with his leathery pal The Machine, click here. Wilson and Ross will be hosting “Dynamite: A Fundraiser for Keenan Cahill” during the game against the Florida Marlins on May 25. Information here.